The day before the earnings release I cut my holding with 30%. So was that a good move? Yes and no. Yes, because the stock price actually initially fell 6-7%, but since I am not a day-trader that doesn’t matter much to me. The stock later recovered and is now trading a few percent below my selling price. No, because they actually came out with the best possible earnings I could imagine, I’m actually surprised the stock has not traded higher. So at the moment the market is still putting a fairly substantial risk premium to this stock, I still feel its american investors not trusting a Chinese company. Well this was a disaster report, I have counted this as one of my value stocks in the portfolio. A lot of the other car sales and services companies in China has started to recover nicely, both in terms of earnings and share-price appreciation. But Zhengtong is clearly lagging her, suffering from mainly their tilt towards BMW cars. BMW sales have been weak, because BMW is not delivering new models attractive to the Chinese consumers. Stock was down -15% on the report and continued down from there, ouch. I bought this just before their earnings release, which was solid, not amazing, but solid. The stock market slowly took the figures to its heart and the stock trended slowly upwards ending up over +8% on the day, lucky start for this holding. OK earnings and net income, but outlook was weaker than expected, the report was not well liked by the market, I think it has been punished somewhat harshly, but my doubling up in this stock just before earnings became terrible, the stock is down -9% from where I increased my position, again, ouch. Tomorrow NetEase, which has become the portfolios biggest position will report results, I still believe in the company long-term but I decided to slice the position somewhat, to lock in some profits while we are close to what I saw as the short term price potential of the stock. I sell 30% of my NetEase holding as of close today. I’m still optimistic about the report though, Tencent released it results today and they beat analyst estimates, mainly due to very strong gaming profits in their mobile games. NetEase is not as heavily tilted towards mobile (yet), but I still see it as a positive that the sector seems to still have some legs to it’s growth. As a Chinese colleague of mine explained to me, the urbanisation has created all these huge cities where people have 40-50 min daily commutes on the subway, what else would they do than play games on their smartphones to and from work. The cash from NetEase I place in CRRC, which I had at a smaller weight and now take up to a full size position. From the cash I have left I also take a 3% position in Autoliv, the stock has been trading fairly weak lately, although they have a lot going for them in the smart car space. Yes, it’s time to deeplet these high cash levels, I have suffered some serious performance drag having 15% cash in an uptrending market. First it was LG Chem announced the other day. As of today’s close I’m allocating a 6% position in my first Pharmaceutical company – and no, it’s not Valeant (although it seems to have bottomed out by now). Develop drugs (metabolism, anti-infection, cardiovascular, oncology etc). Provide Healthcare services, they have been fairly aggressively buying up hospitals. In Co-operation with it’s big shareholding and partner Sinopharm they co-operate in drug distribution in China. In general I think the Pharmaceutical companies need a re-visit, after being the market darling stocks, they have taken a beating lately and I have been looking for a good candidate to invest in. Fosun Pharma listed in HK is fairly cheap, trading at trailing P/E 15 and looking like 2016 figures will come out around P/E 13-14. 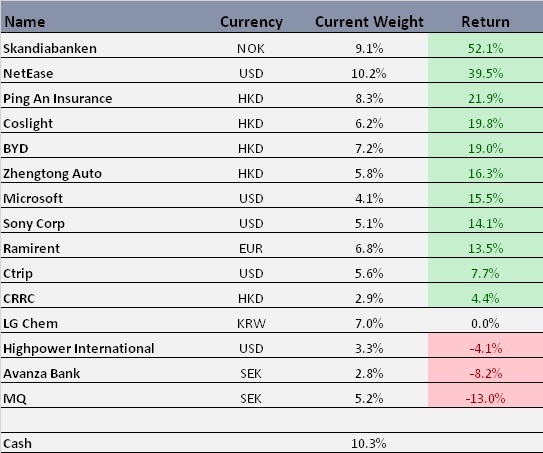 The stock looks oversold and the China listed stock has started to move upwards lately, the spread between China and HK listed stock is as stretched valuations as they historically ever been. See picture below for spread in orange. Fosun Pharma is a big shareholder (11%) in the pharmacy distributions company SinoPharm, this stock has been soaring lately. This holding accounts for over 50% of the price for Fosun Pharma’s stock price, meaning you get the rest of it’s business very cheap. I need a Pharma holding in my Portfolio. This is the first time the China listed stock has been moving so significantly, without any spike in either the stock or the Chinese stock market. I also include a Portfolio update (not including Fosun Pharma yet). Skandiabanken came out with fantastic results that beat estimates, after Altor came in as a new big investor, the stock has been soaring. As always when you bet correctly you wish you did not allocate more in an earlier stage, but with this significant gain the current weight in the portfolio has become a high conviction position. NetEase continues to deliver, awaiting a report in a few days, if the stock keeps soaring I will probably cut the weight in this one short term. It’s a struggle to stay long-term in companies where the gains you were hoping for over the coming 1-2 years materialize in 3-4 months. Definitely the type of luxury problems I would like to keep having. Microsoft also came with a beat, the market seems to start to value it’s Cloud business (my reason for investing), not sure about the hefty price tag for buying LinkedIn though..
Sony beat estimates with a strong report, I read some comment like “Nintendo should look at Sony, a Japanese game maker that actually makes money”. 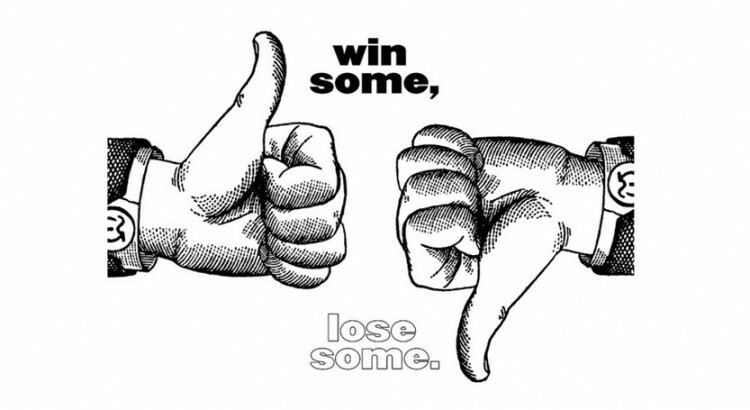 One big disappointment was Ramirent’s report and the market struck down the stock -13% over two days. The momentum seems to keep holding though, which was one of the one the reasons I bought this stock (no I’m not a value investor). Overall in the strong market many holdings has started to recover (Zhengtong, Ctrip, CRRC and MQ). The only company that is strangely weak is Avanza Bank, I might need to re-evaluate this one, as I always listen to what the market is trying to tell me. Stocks going side-ways in a up-trending market will not do well the day the market breaks down. I have also discussed this company with some friends who are knowledgeable about Swedish Banking, they think Avanza will have a tough time finding ways to making money out of their customers. More to follow.. So after the sale of Criteo the portfolio has been suffering from way too high (unintended) cash levels (17%). Somewhat hurtful in a market which just keeps rallying. So it’s high time to add a new holding to the portfolio. Today I initiate a full position at 7% in LG Chem listed in Korea. This is large Chemicals company that also happens to be one of the major battery manufacturers in the world. LG Chem has also had the most sophisticated batteries for electric cars, in terms of cost per kWh and I hope they will defend that position. Due to this technical advantage LG Chem has tied many car manufacturers to its list of customers. Among these are Chevrolet and the Chevy Volt seems to be selling well and soon the all electric Chevy Bolt is going to be released. Although my main reason for buying LG Chem is their growth potential in batteries, one have to be respectful that 85% of their current sales comes from elsewhere and mainly from the Basic Materials & Chemicals division, which produce different type of petrochemical products. What I like about this, is that the battery industry at the moment is in a stage of heavy investments. Some serious cash is needed to build and ramp up production of the next gen batteries. Most of the smaller players can’t handle that, thanks to LG Chems other divisions generating significant cash, they are able to do just that. So I believe I get the petrochemical business at a reasonable multiple with good potential for growth in the battery division over the coming 5-10 years. This is a very long-term play though and much can happen on the way there. Inside EVs is a great page for keeping on-top of the world of EVs and batteries. They do some nice data on EV sales in the US, as can be seen below. Very interesting to me is how the Chevrolet Volt (which is a Plug-in hybrid) has started to gain some serious momentum, surpassing the Model S in sales. This car makes a lot of sense to commuters and I think this is the big selling point of EVs at the moment. We are still far away from EVs being the ultimate car for all situations. But commuting cost money and time, and with EVs you can reduce the monetary part significantly and in the US often also time, since you are allowed to drive in the High-Occupancy Lane normally reserved for people that share their car with others for the commute. The 13423 sold cars in July sums up to about 0.9% of the total vehicle sales in the US. So penetration is still at very early stages. As can be seen sales is driven by very few models at the moment. 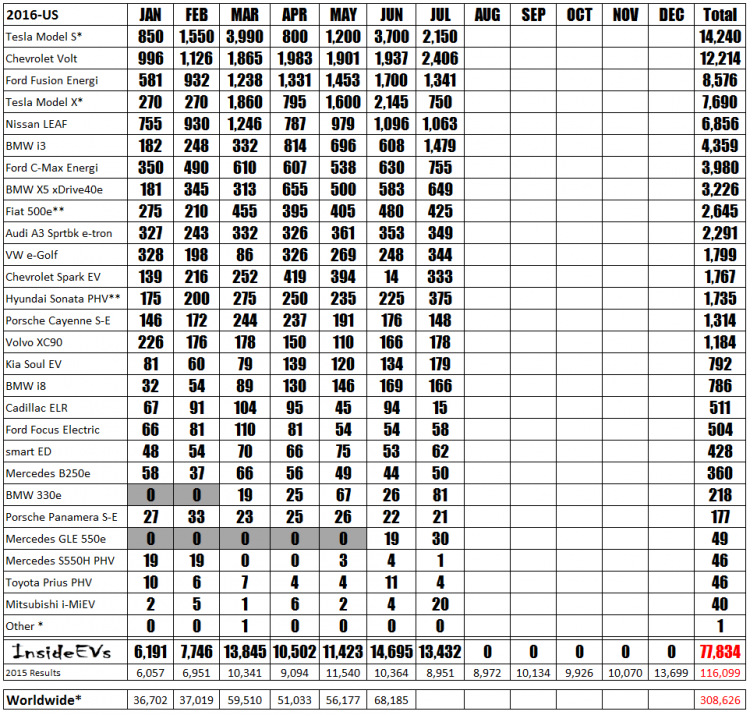 With the Tesla Model 3, we can probably expect at least 10 000 units per month just from that car (based on pre-orders). 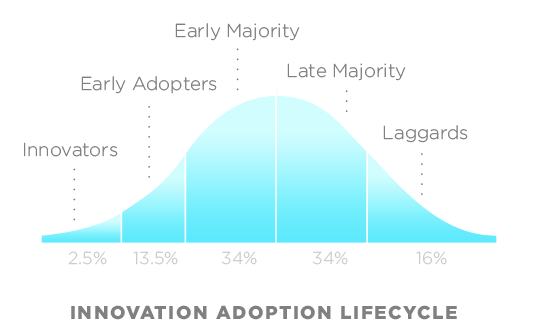 I think we are not that far from moving from the the Innovators stage to actually talking Early Adopters. 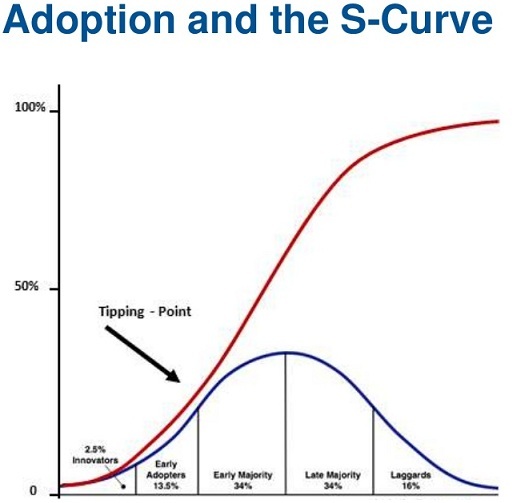 As you know technology often follows an S-curve, when a tipping point is reached, it goes very quickly (think fridge, flat-TV or Smartphone). So still very hard to see when we will reach the tipping point, but many have guessed around 2020. I think it is somewhat too optimistic and that we will linger in the 5-10% penetration range until the big players like GM, BMW, Audi really jumps on the train and that is when we will see enough charging stations around the world as well. Just looking at me personally, I have not had the urge to move over to EV, but with the Model 3, Chev Bolt, or hybrids with pure EV range that actually is enough for most shorter rides we city people do, it starts to make sense. To me personally the one problem holding me back is the question about charging. Important to keep an eye on penetration rates, all of a sudden sales will start to move quickly. Norway is the only example where they already reached the tipping point and as they did it moved quickly. Also good to keep track of which battery producer is supplying which car. For example LG Chem is supplying Chevy and Samsung SDI is supplying BMW.